All classes are held in our upstairs classroom space at 22 Main Street--unless indicated otherwise--in the Village Hall on the corner of Main and Fair Street. Contact us at (607) 547-9777 for more information and to register! 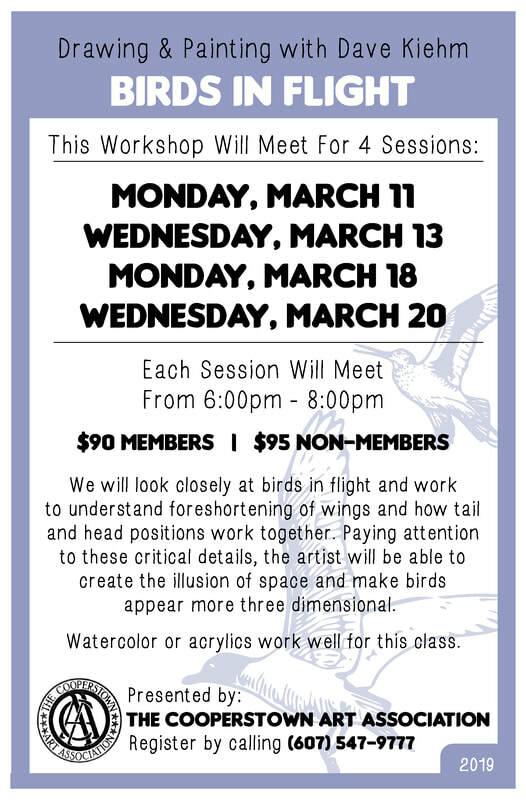 Back by popular demand, Dave Kiehm will return to the CAA in March to continue teaching us about the basics of bird illustration techniques, focusing on drawing accurate anatomy and proportions and use of color. It would be helpful to have at least some drawing and painting experience if you'd like to take this class. You may use watercolor or acrylics. For a materials list, click the link below! This is the perfect time of year to spend some time outdoors capturing the beauty of our local landscape! Call 607-547-9777 to sign up for this class or if you have any questions! This class will concentrate on drawing and painting fruits and vegetables in watercolor. The focus will include: tonal pencil studies, mixing colors, pleasing compositions and watercolor techniques. Classes include demonstrations and are enhanced by individual instruction. Bring your own materials! David has provided a materials list HERE! Come spend Sunday afternoons at the Cooperstown Art Association exploring new ways of seeing and interpreting the landscape. With an eye towards painting en plein air (outdoors) we will utilize older paintings or appropriate photographs to revisit the basics of design, composition, and value. We will experiment with underpainting, the use of a limited palette, different tools, surfaces, and paint application. Whether or not one has an interest in en plein air painting, this class is open to anyone who wishes to experiment with color, application, mixed media and process. Some materials will be provided but if you are new to the class, please contact the instructor for more information. Enjoy drawing and painting botanical watercolor illustrations in a relaxed atmosphere. This class is designed for both inexperienced students and those who wish to improve their skills. Classes include demonstrations and are enhanced by individual instruction. Work at your own pace. Having trouble getting watercolor to do what you want? Can't get the desired effect? Just want to learn more about using this versatile medium? This class is for you! Traditional watercolor techniques such as wet-in-wet, masking, the use of transparency and color mixing will be explored. Subject matter will vary! Landscapes, still-life, portraits, animals, or personal projects may be explored through demonstrations and individual instruction. Bring your own materials! Doug has provided a materials list HERE! The Cooperstown Art Association is located at 22 Main Street in Cooperstown, NY, in the Village Hall on the corner of Main and Fair Streets. 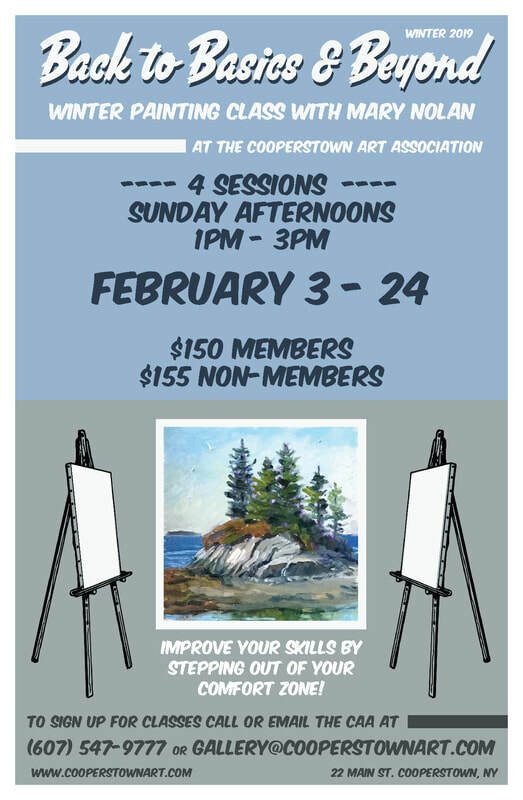 Please contact the Cooperstown Art Association at 607-547-9777 to register today! Gallery Hours: Daily 11-4. Sunday 1-4. Closed Tuesdays Labor Day through Memorial Day.